Aston Martin presents the Vision Volante Concept, a study of a premium VTOL with hybrid propulsion. Whether the three-seater will ever take-off on a mass scale is uncertain. 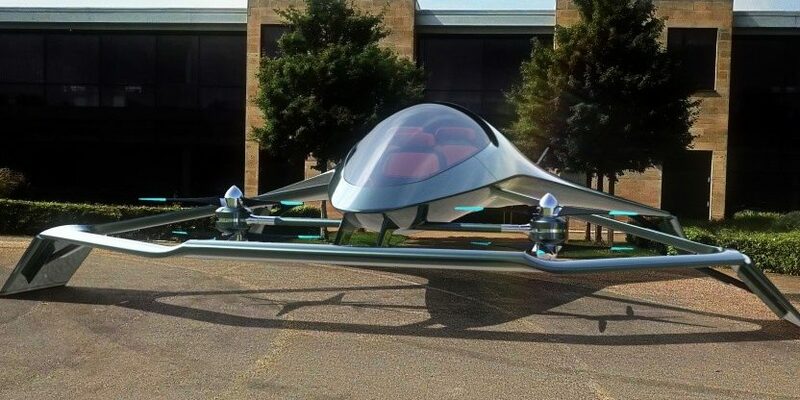 Yet Aston is on to something as Rolls-Royce also issued their version of an air taxi. In fact, many companies such as Uber, Audi and Airbus as well as Volocopter are looking into electrified air taxis for personal transport. So the move by both Aston Martin and Rolls-Royce appears almost natural and adds a notion of luxury to the flying circus. Aston is currently showing their “flying car” at the Farnborough International Airshow in Great Britain. Like its conceptual competitors, the Volante Vision can take off and land vertically. Instead of all-electric, Aston Martin opted for a hybrid system to power the air taxi’s three propellors. The premium in the Volante is its ability to fly autonomously, says Aston Martin, and also points to a luxurious interior. The Volante has been produced in partnership with Cranfield University, Cranfield Aerospace Solutions and Rolls-Royce. The latter is adding their expertise in propulsion systems. In fact, Rolls-Royce has entered the aerospace sector before as it is working with Airbus and Siemens on the E-Fan X. This 100-seater hybrid aircraft is to launch into regular service on regional routes from 2020 reportedly. For the current air show at Farnborough, RR brought their very own vertical starter study. The EVTOL (Electric Vertical Take Off and Landing) concept is large enough to carry up to five passengers. Despite the name, it would not be purely electric though, as gas turbines would produce the 500 kW needed to power the six propellers. It would run on electricity once airborne however at speeds of 400 kph at peak. Range is estimated at 800 km. For now, the EVTOL is nothing but 3D renders. However, Rolls-Royce stresses that their air taxi concept is based on technology that either already exists or is about to be finished so that their hybrid EVTOL may launch early on in the next decade.